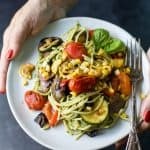 Basil Pesto Pasta tossed with fresh Grilled Vegetables, this pasta recipe will quickly become a summer favorite! A couple weeks ago I was polishing off a whole watermelon a week all by myself. It was the only thing that would settle my stomach for a while. Now I’ve moved on to bags of cherries. Anyways. This post isn’t about cherries. It’s about this amazing pasta that you NEED to have in your life! 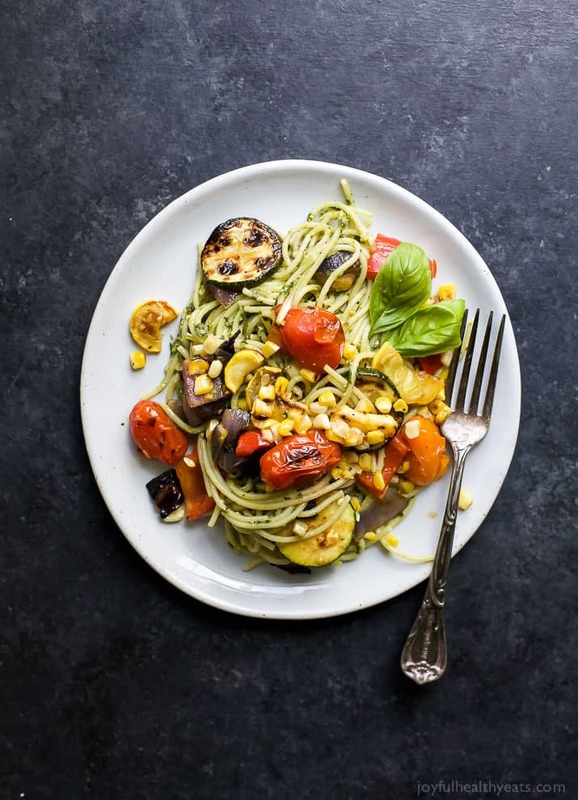 Recently I came across a new gluten free pasta brand and it is quickly becoming a favorite… have you heard of Ronzoni? I just saw it in the grocery store and thought I’d give it a try and now I’m in love. It doesn’t have a starchy taste to it. 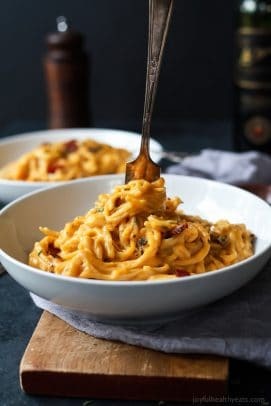 It has a nice bite to it just like regular pasta and it doesn’t drastically reduce in size, which is a problem I’ve had in the past. Instead of making one box I’ve had to make two to feed my family.. and that’s just annoying. I love this pasta and it is becoming my go to. 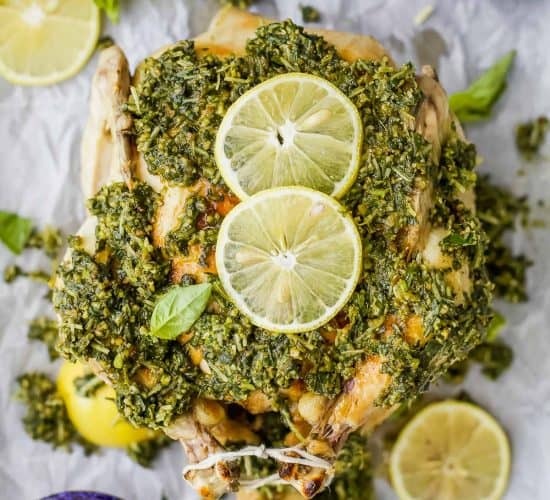 Now adding a homemade basil pesto sauce to it just takes it up a notch with the vibrant lemon and fresh basil flavor. 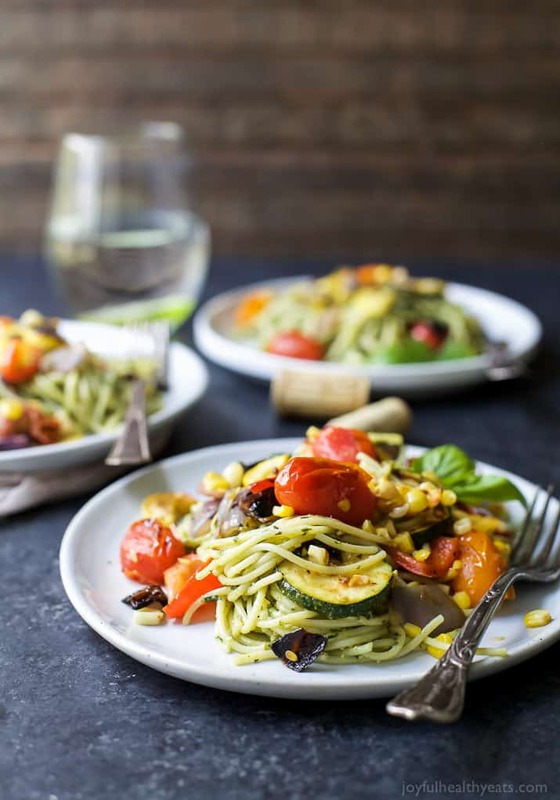 Then I topped it with fresh summer grilled veggies … zucchini, squash, corn, charred red onions, and burst tomatoes. 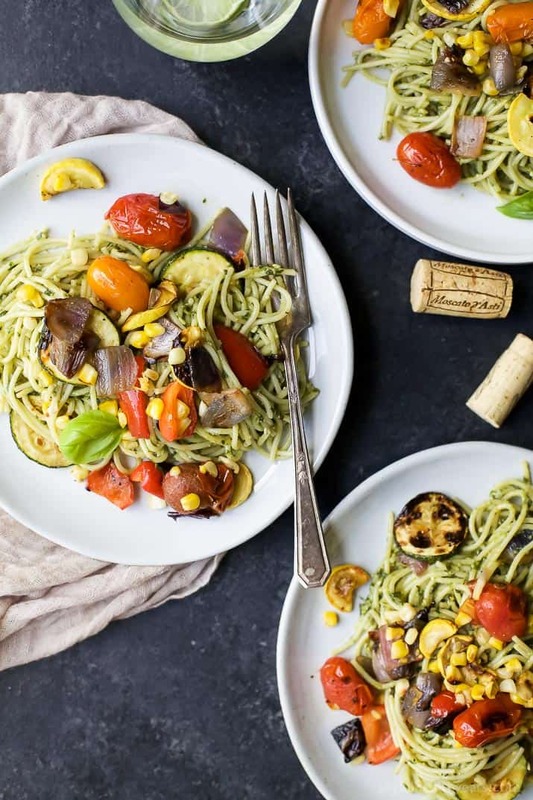 This Basil Pesto Pasta has all the flavors you’ll love. To me there is nothing better than fresh grilled veggies in the summer. I could literally eat them all summer long. 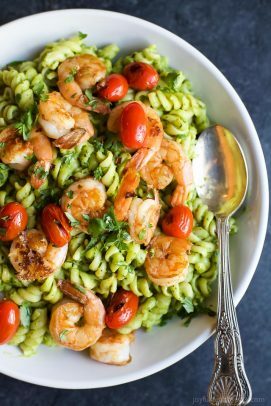 But tossed with pasta and fresh pesto. Ya’ll… so stinking good! I promise you won’t even miss the meat! And what makes this dish even more enticing is it only takes 30 minutes to make. Woot Woot! 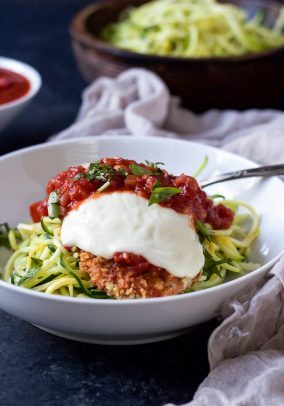 This could definitely be an easy weekday meal and it’s great as leftovers the next day too, just add a squeeze of fresh lemon to freshen it up and you’re set. To a food processor add fresh basil, pine nuts, salt, pepper, a garlic clove and lemon zest. Pulse until the basil is finely chopped. Slowly pour the olive oil in and continue to pulse until the mixture is smooth and forms a sauce. Pour mixture into a bowl and fold in the parmesan cheese and set aside. To a large bowl add red pepper, red onion, zucchini and squash. 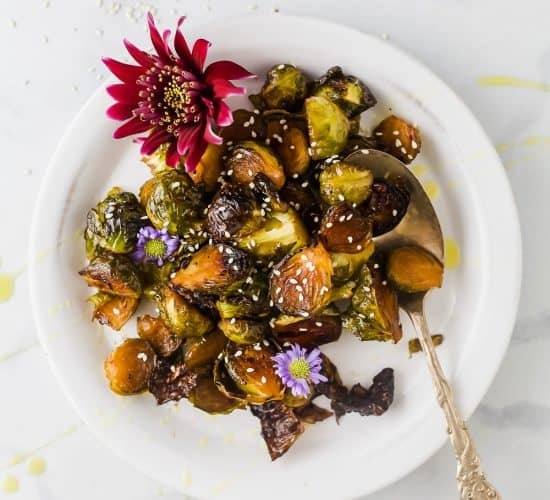 Drizzle 1 tablespoon of olive oil over and season with salt and pepper. Toss to coat all the veggies. Put veggies in a grill basket and grill until charred, about 5-7 minutes, tossing throughout. Remove from grill and add tomatoes to the basket. Grill until the tomatoes start to burst, about 3-4 minutes. In the meantime also add ear of corn to the grill. Grill each side for 3-4 minutes, until slightly charred. Drain and rinse noodles. 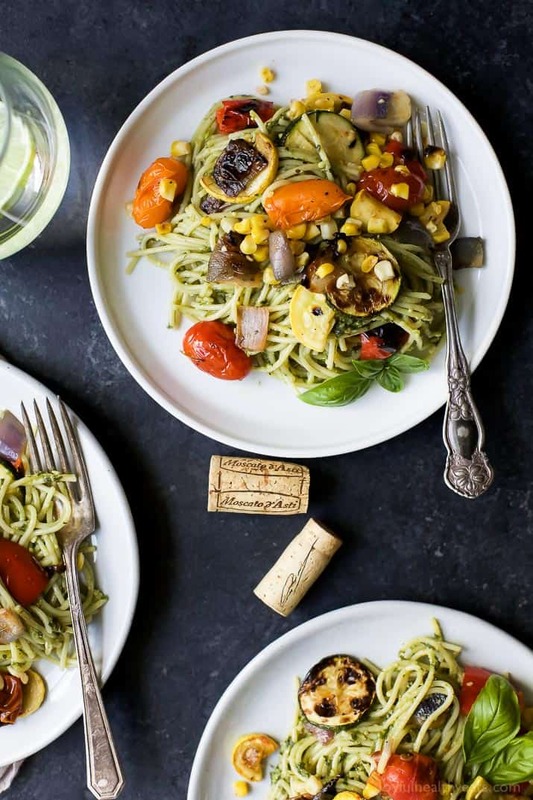 Pour noodles into a large bowl with the pesto. Gently toss the noodles with the pesto until the noodles are coated. Add in the grilled vegetables and toss. Want More Delicious Pasta Recipes? My husband is our cherry monster, haha! I have to keep a secret stash out in our garage fridge…dont’ tell anyone! 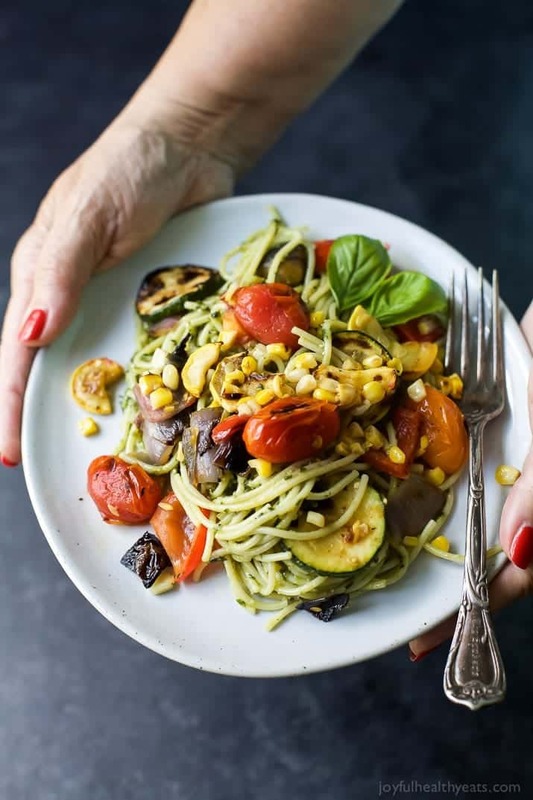 I’m an absolute basil pesto junkie and love that this is a meatless option. I’ll be making it this week for sure! hahah… i love it! I so need to keep a stash of cherries outside too! This looks amazing! I LOVE your photos. That background is beautiful, did you buy it or make it? I need to get some new ones…I was going to order some but have seen some good DIY food photography backgrounds. Have you ever made your own? 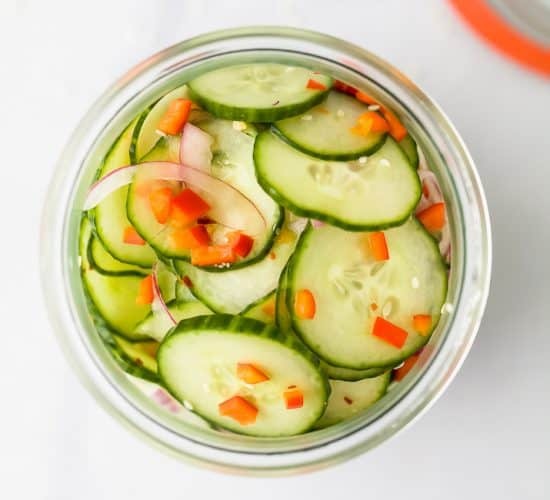 This recipe looks perfect for camping this week – so fresh and summery! Thanks! I actually bought it at erickson woodworks, love their big custom made boards. That is one beautiful pasta! I can’t wait to make this! This is perfect for summer — love those grilled veggies! It sure is Dee! Grilled veggies are the best! So good!! This looks like summer on a plate! I could eat this up all week long. Nice! 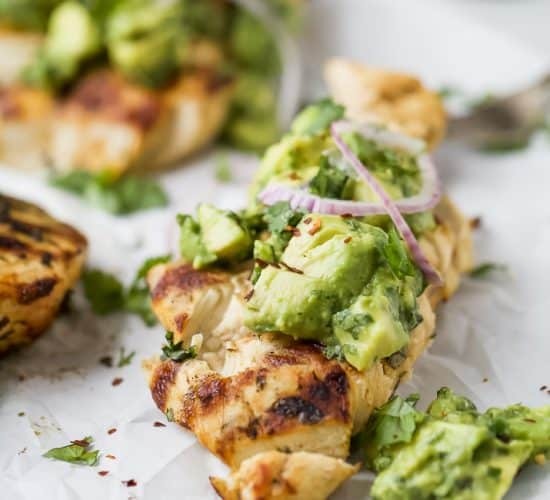 This looks perfect for a quick summer meal. Loving the pesto addition. Thanks Michelle! It’s so light and refreshing! Now, this is my kinda Summer dinner! Now THAT is the perfect summer plate!